My husband, George, and I just returned from another fabulous week at Errington’s Island Resort. Over the next few days/weeks, I will share some of the highlights and pictures from our trip. 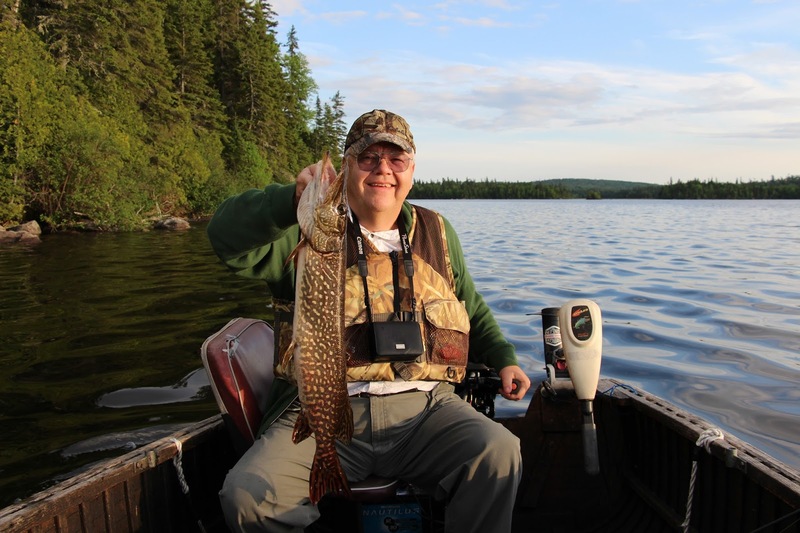 George was so eager to start fishing that we went out immediately after a marvelous dinner of Cornish hen, rice pilaf and glazed carrots, the first of Chef Joey’s many delicious meals. Although we only had a few hours of daylight in which to fish, it paid off well. Team Cook landed a 29″ pike that evening along with several nice walleye. The evening was fishing for fun and strictly “catch and release”. We did, however, enter the Team Cook pike into the Catch and Release drawing. 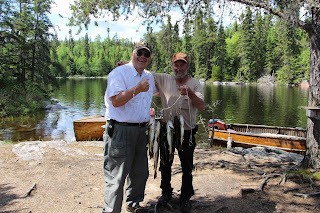 The next morning we hired Larry, one of the lodge’s best fishing guides, for a half day of guiding to show us some spots that have been productive this year. Even though this was our seventh trip in five years to Errington’s, we had never used a guide. It is always nice to learn some new spots on the lake and Larry showed us quite a few that proved to be very productive. As you can see from our stringer, we caught more than enough fish for a delicious shore lunch. Frankie and Dakota met us at a secluded island at noon. The fire was roaring and potatoes, fritters, beans and onions were already cooking. Larry quickly cleaned the fish and before we knew it, we were sitting down to a fabulous, all you could eat shore lunch. Thank you Larry for a wonderful morning of fishing and thank you Frankie and Dakota for an excellent, all you could eat fish fry prepared for the two of us.